Initially, DBS College was started as a science college of the region by Dr. M B Srivastava, the founder Principal of the college. From the very beginning the Department of Chemistry played a pivotal role in the development of the college and establishing its reputation as a leading centre for imparting excellent education in science subjects in this part of the country, with an active support of the founder Head of Department Dr. B.B. Raizada. Being common to the main stream of Science, a majority of students of science passing out from this college were associated with the Department of Chemistry. From a small beginning in 1961 when degree classes were started, the department grew into a full fledged post-graduate department with the opening of post-graduate classes in 1969 and reputation grew in leaps and bounds so much so that is was one of the most sought college for admission seekers. The college has established a unique record of 100% 1st divisions in MSc final examination for number of years in addition to high percentage of 1st division in degree classes and a large number of merit positions in the university. The faculty strength has reached to sixteen. 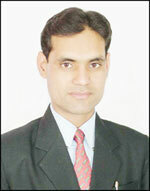 Besides Dr. Raizada, the past faculty member were Dr. Narendra Kumar, Dr. R.G. Sharma, Dr. T.S. Rawat, Dr. K.LSindhwani, Dr. R.K. Srivastava ,Dr. C.K. Saini, Dr. B.B. Gupta, Dr. B.Pal., Dr. A.K. Gupta, Dr. Kamal Ratan, Dr.P.D.Saxena, Dr. V.K.Maheshwari and Dr. A.K.Nigam. The present Head of the Department is Dr. A.K. Srivastava next to him is Dr. S.K.Saxena with other young and devoted faculty members namely Dr. Anju Bhatnagar, Dr. Shail Kulshrestha, Dr. Mahima Srivastava, Dr. Surekha Kannojia, Dr.Rakesh Singh, Dr. Sonu Diwedi,Dr. Radhey Shyam and Dr. Ajay Kumar. The department had completed many research projects funded by the ONGC, U.G.C and C.S.I.R. awarded to various faculty members. The department continues to have many research projects at present and is serving as a major guidance centre for Human Research Development. Recently two days National Conference on “Environmental Conservation, Sustainable Natural Resource Management and Strategies for Regional Development with reference to Uttarakhand” was organized by the Department on May 1-2, 2011, coordinated and efficiently managed as organizing secretary by Dr. Shail Kulshrestha to celebrate the International Year of Chemistry-2011.This conference spearheaded the Golden Jubilee celebration and marked the opening ceremony of the 'Swarn Jayanti Sabhagar'. She has also presented a paper “Estimation of toxic metal content in vegetable samples in International conference at Bangkok. The department has to its credit the publication of more than 100 research papers. It is efficiently handling minor and major research projects. Not only this the past and present faculty members have authored many books on Chemistry.